In Taksim, a group calling themselves "Anti-Capitalist Muslims" did their Friday prayer in respect to police officer Mustafa Sarı and protester Abdullah Cömert, who have lost their lives in the protests. 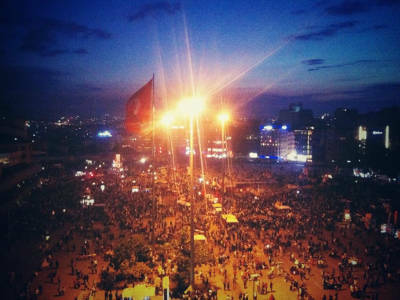 Due to high school entrance exams, protesters were quiet in Taksim and avoided clashes in other regions of İstanbul as well. 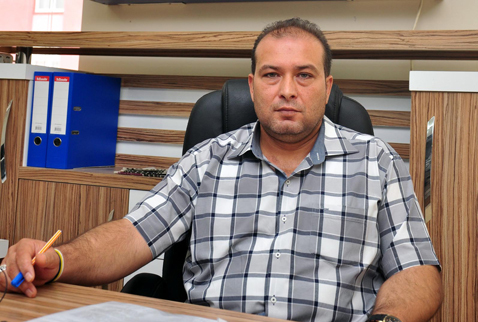 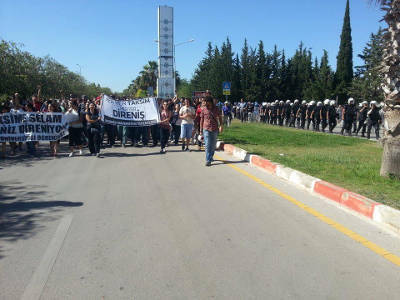 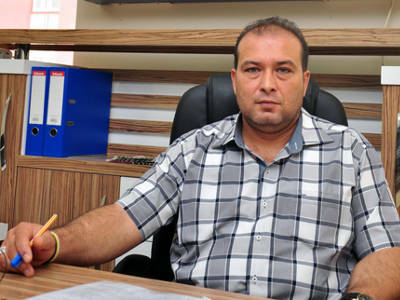 In Adana, union of security officers (Emniyet-Sen) stated that "It is not police forces that is responsible, but the government." 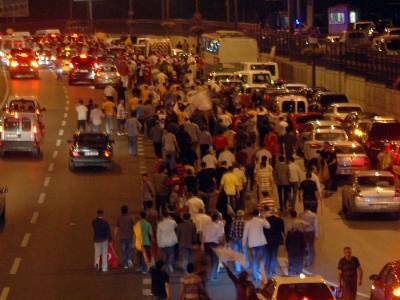 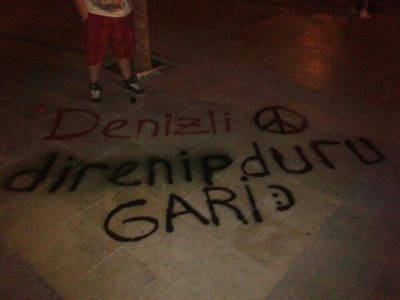 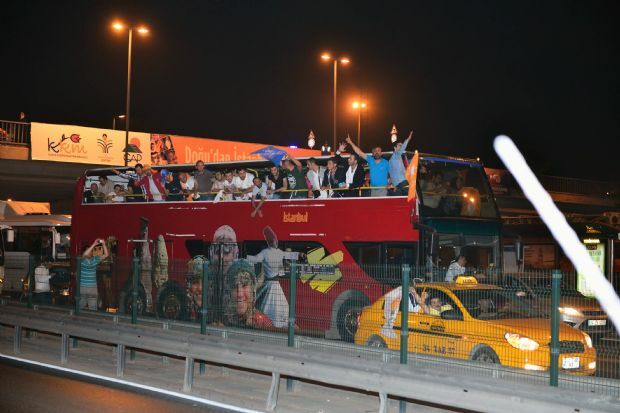 In Antalya, investigations began for those who intervened the protesters with sticks in their hands in 3 June. 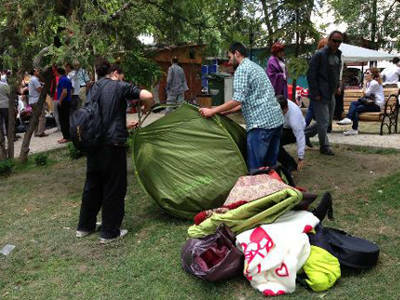 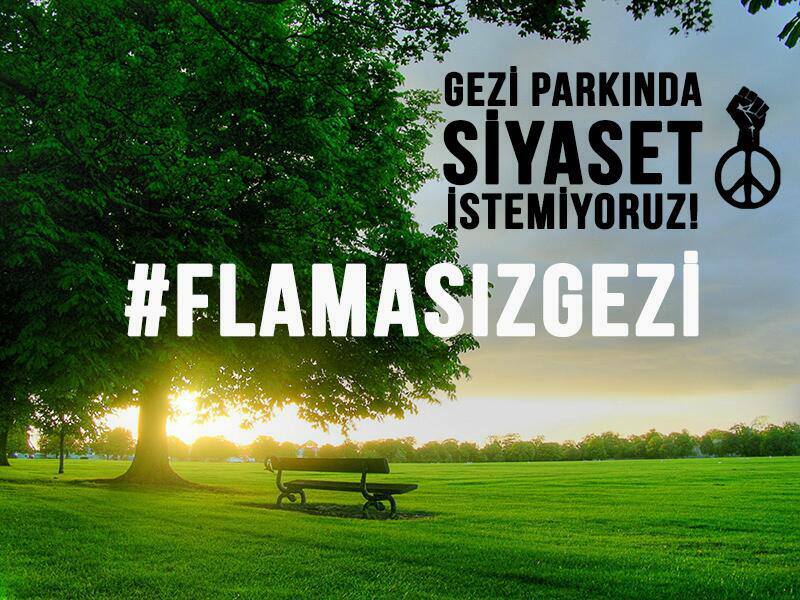 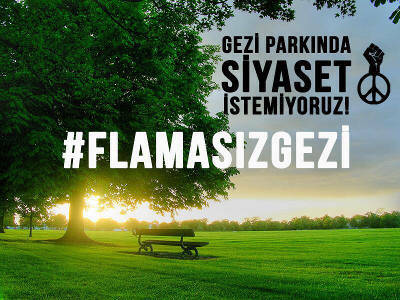 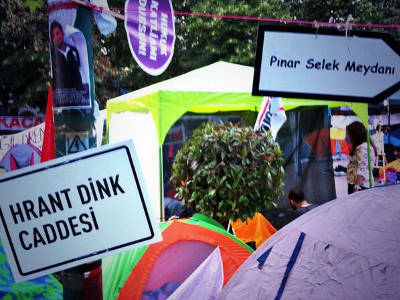 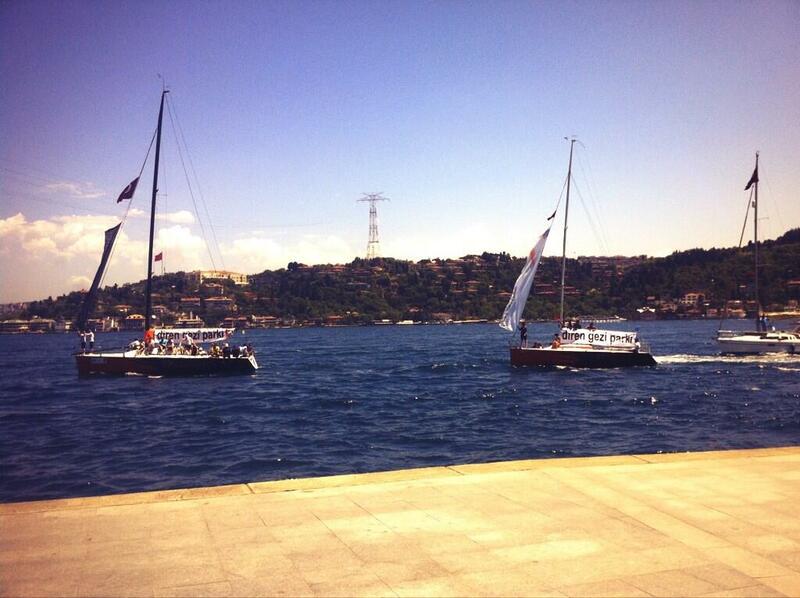 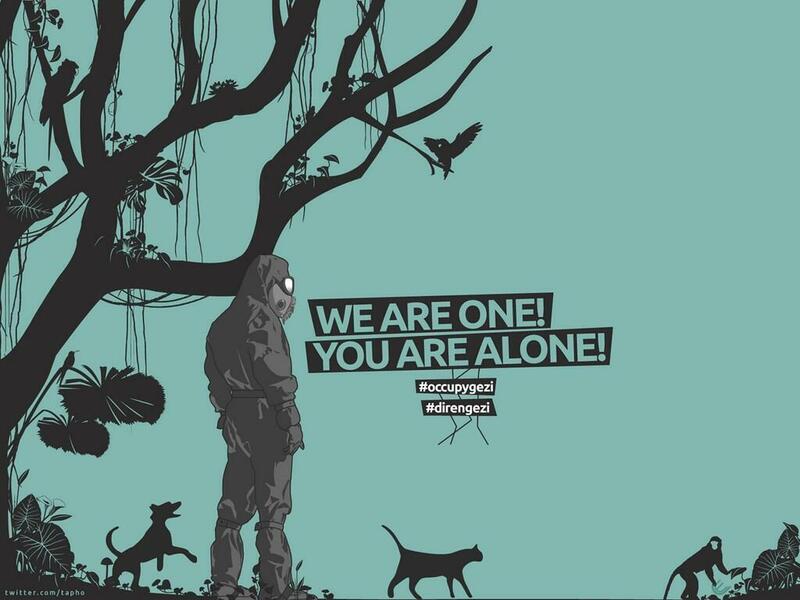 In Ankara, after police warning, protesters moved their tents in Kuğulu Park. 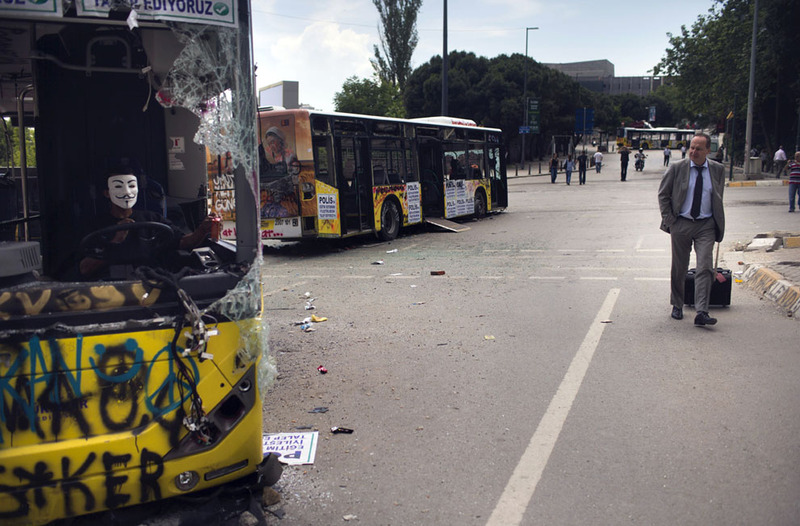 Amnesty International started a campaign calling to stop the police due to more than 2,000 injured civilians. 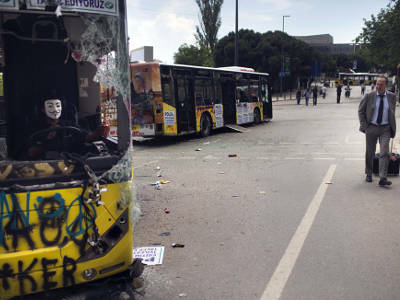 In his European Union speech, Erdoğan stated that similar situations occured in Germany, Greece and US, further he said that 17 people lost their lifes in Wall Street protests. 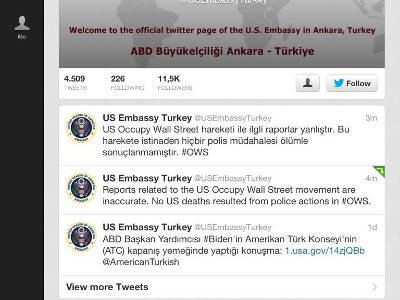 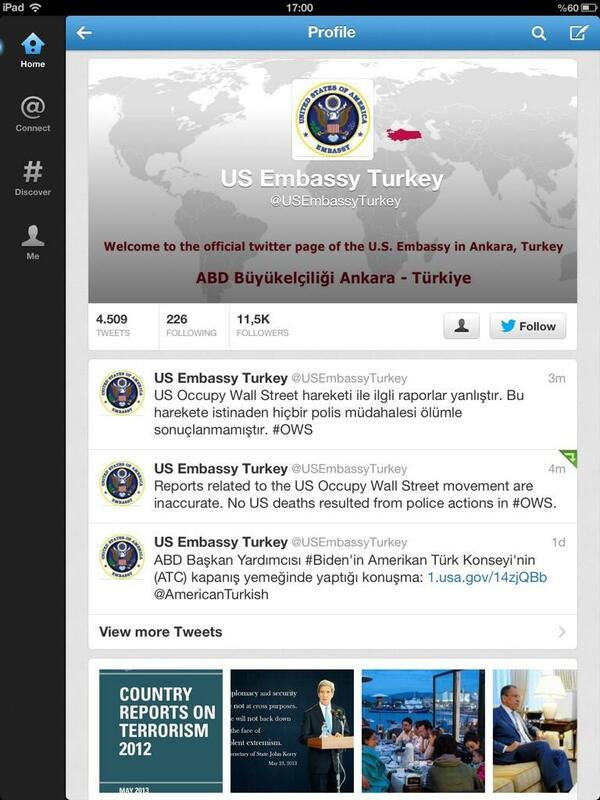 In response, US Embassy of Ankara tweeted that "Police interventions are not caused any loss of life in 'Occupy Wall Street' protests." 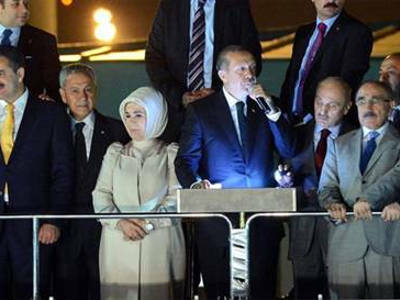 In addition, Erdoğan also stated that Koç University was also built on forrest land and he could not prevent that construction. 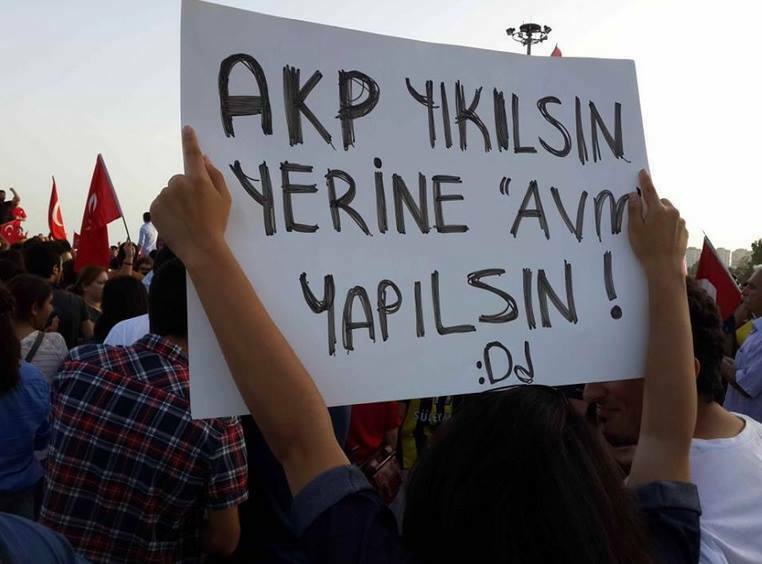 It is written that "You signal is enough!" 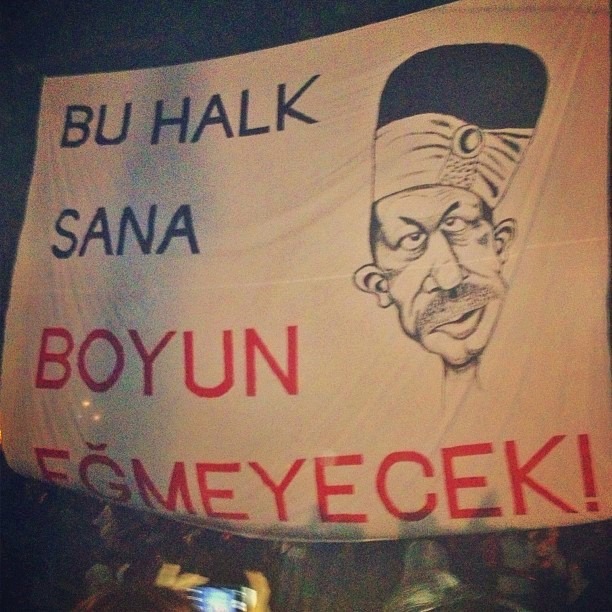 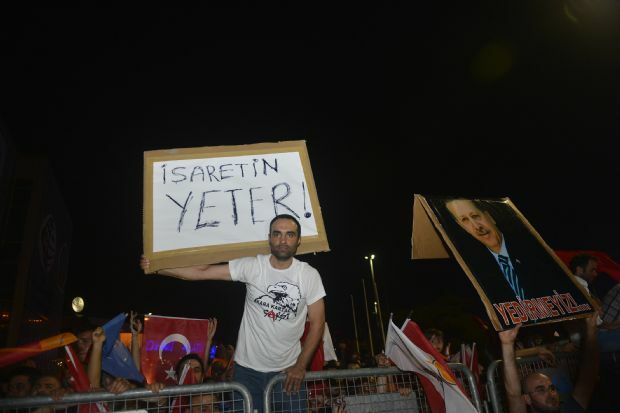 referring to the speech of Recep Tayyip Erdoğan "We can barely keep our voters at home." 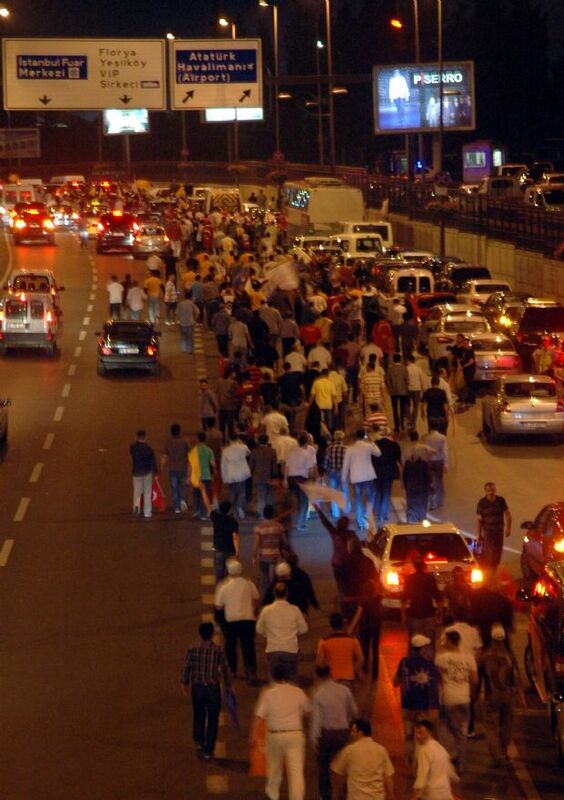 People are on their way to the airport. 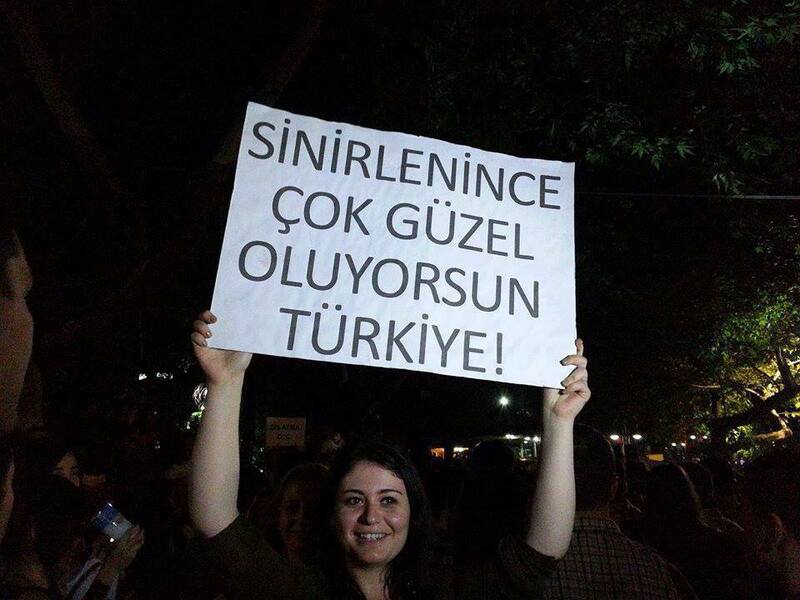 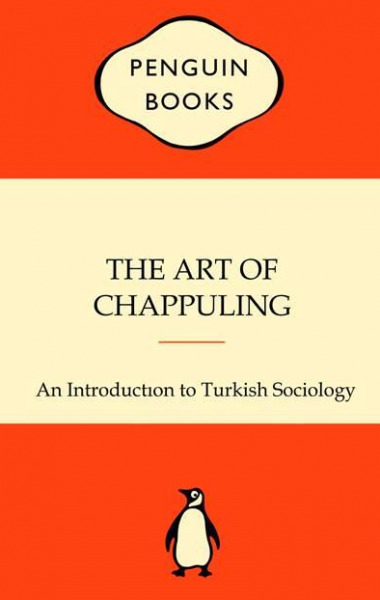 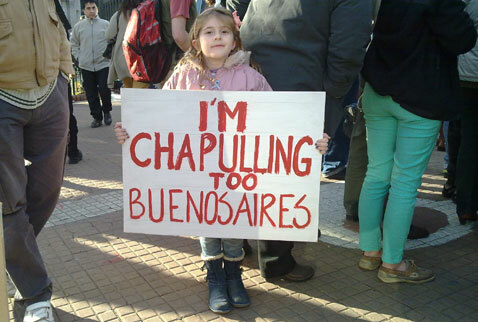 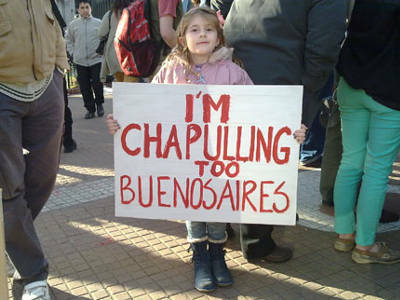 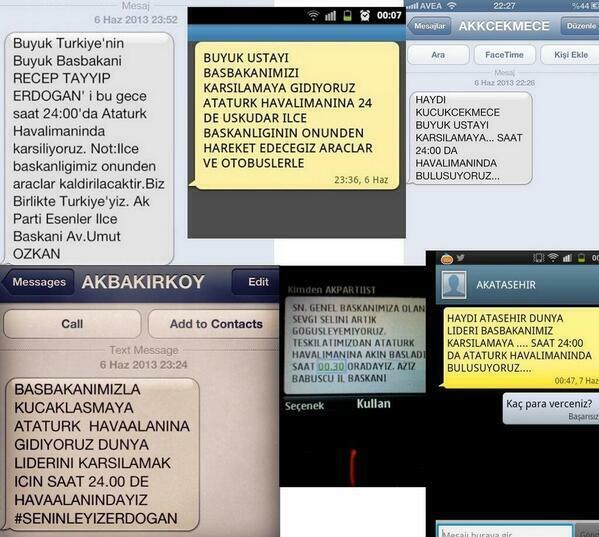 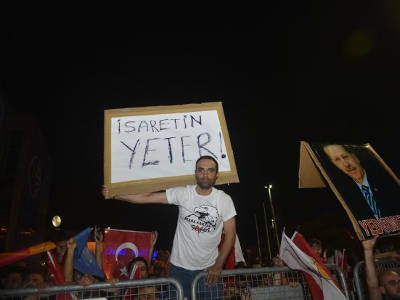 In the airport, a group of supporters is mistakenly chanting the wrong slogan "Tayyip beware, do not push our limits." 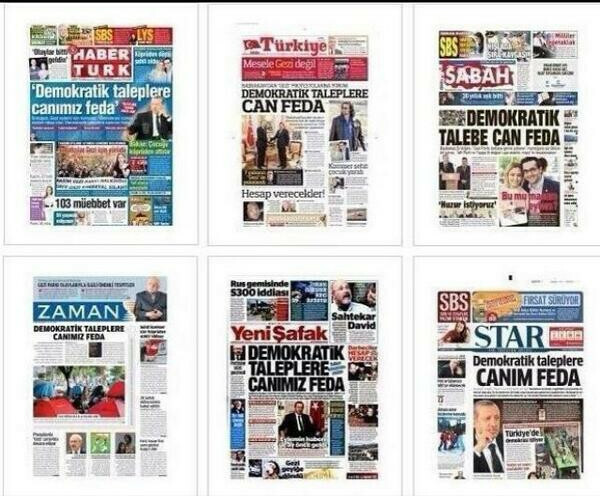 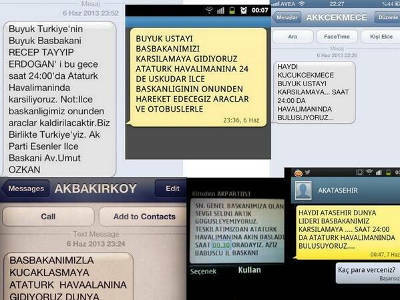 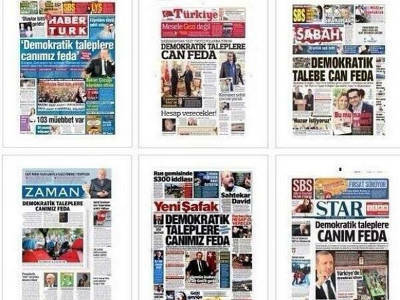 After Recep Tayyip Erdoğan's speech at the airport, 7 Turkish news papers (Haber Türk, Türkiye, Sabah, Zaman, Yeni Şafak, Star) used identical headers for their tomorrow releases: "Any democratic demand is welcome." 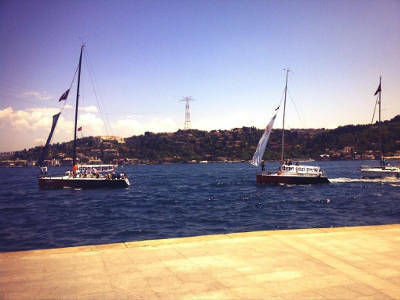 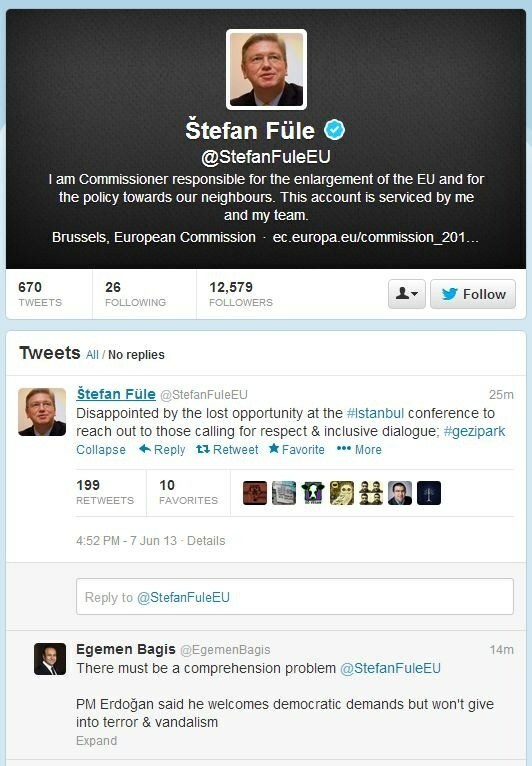 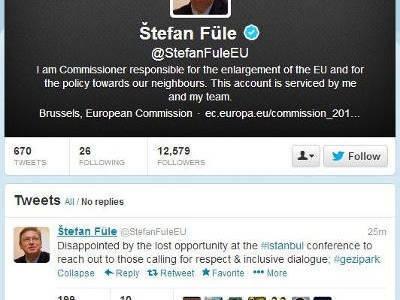 European Commision Member Štefan Füle tweeted that "Dissappointed by the lost opportunity at the #istanbul conference to reach out to those calling for respect and inclusive dialogue #gezipark" (Hürriyet) In response, Egemen Bağış, minister for EU Affairs and chief negotiator of Turkey, replied to the Tweet as follows: "There must be a comprehension problem." 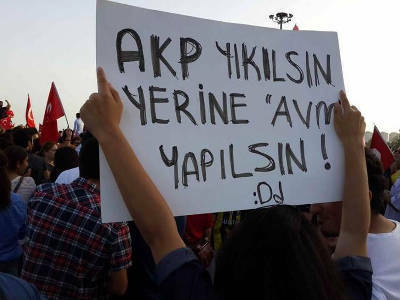 "90% of people who state that they do not want a provocateur prime minister are known as provocateurs by 90% of the citizens." 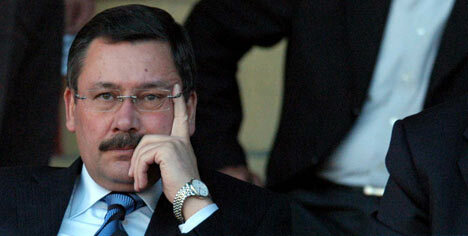 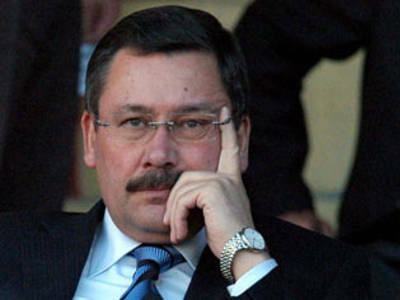 İ. Melih Gökçek, Mayor of Ankara. 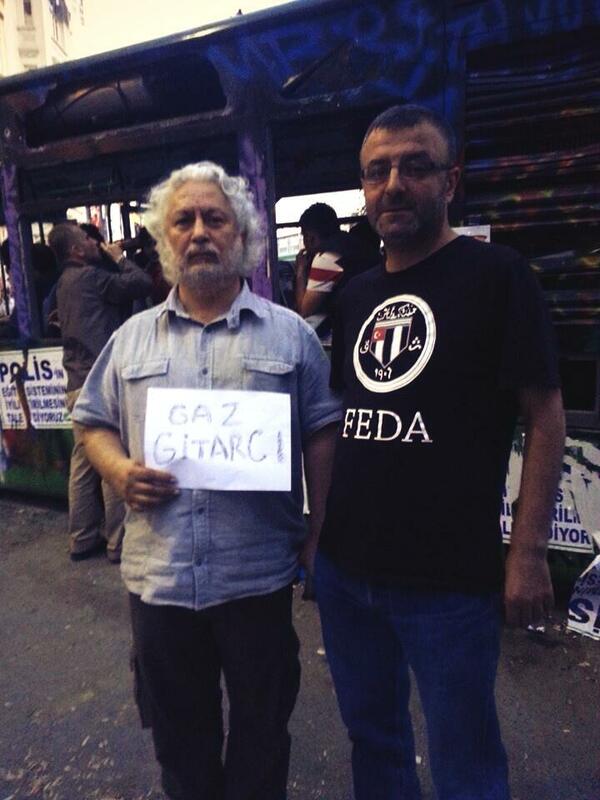 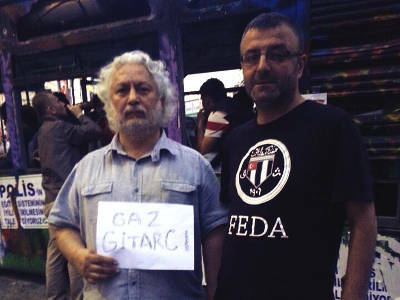 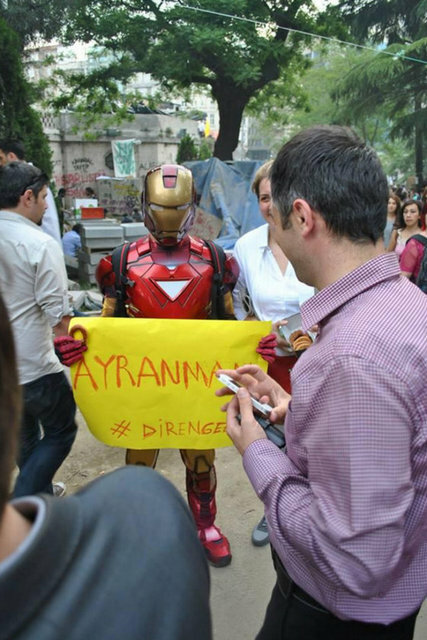 Music artist Erkan Oğur is also supporting Taksim Gezi Parkı protests. 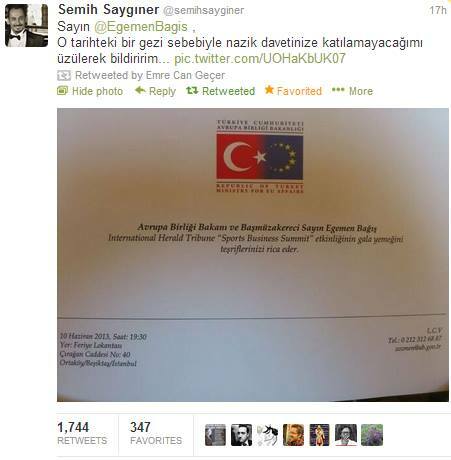 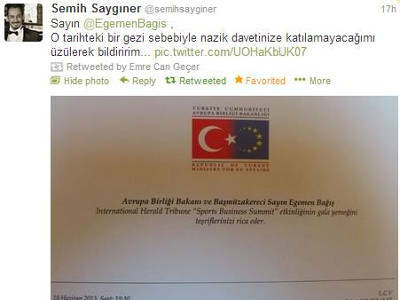 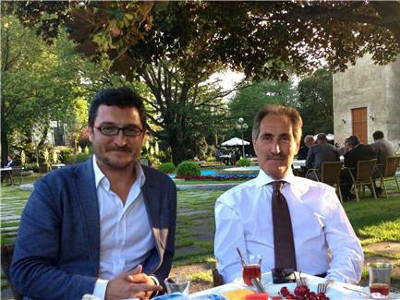 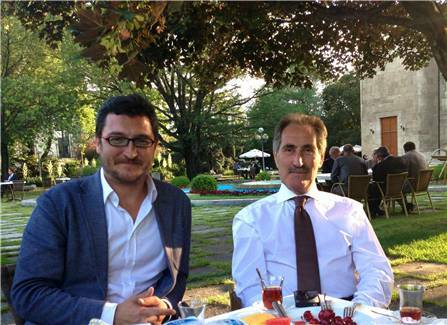 Turkish billard player Semih Saygıner rejecting the gala dinner invitation of Egemen Bağış, minister for EU Affairs and chief negotiator of Turkey, due to Gezi Park protests. 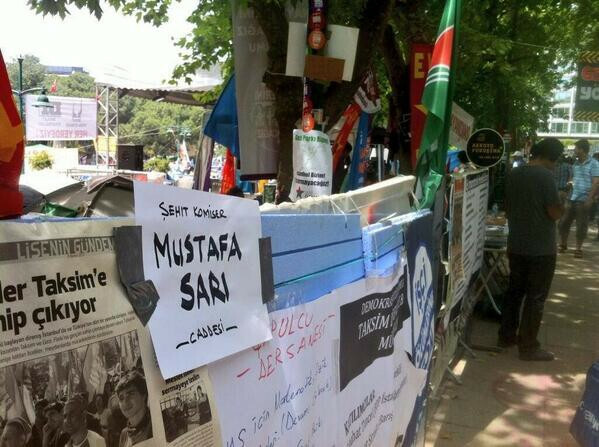 Protesters naming streets in Gezi Park with murdered Turkish journalists. 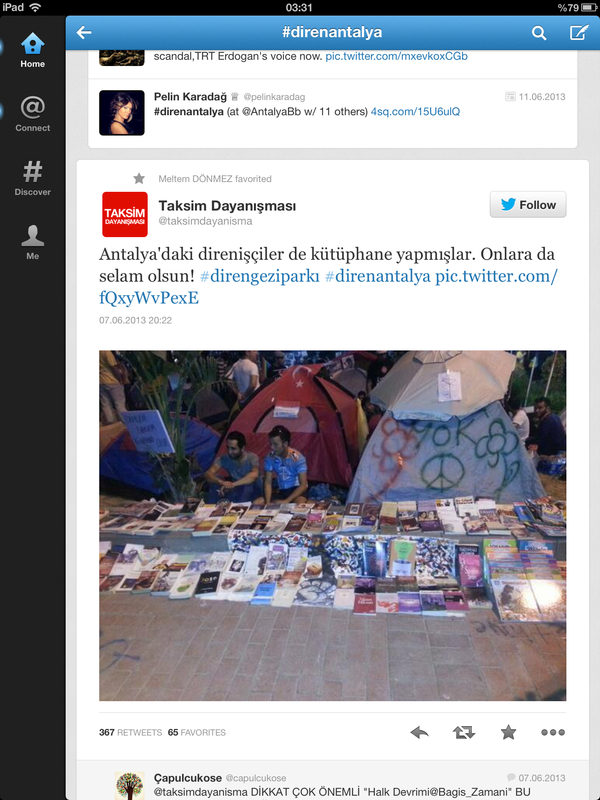 Amnesty International called for the stop of the police brutality in İstanbul. 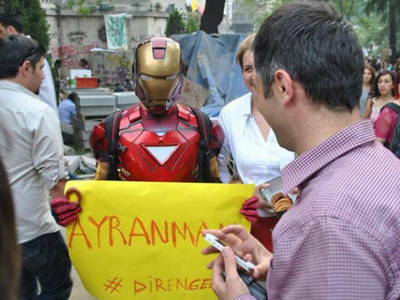 A scene from the Wall Street protests in US. 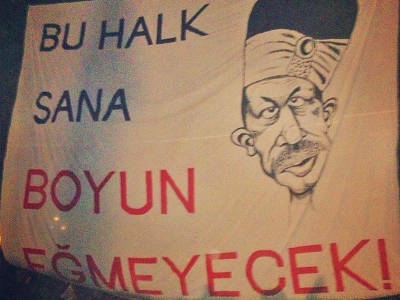 "These people will not bow to you." 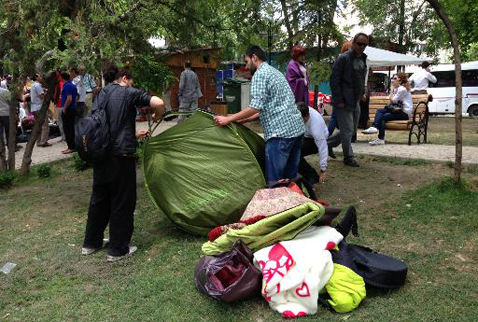 In Ankara, after warning from the police, protesters removed their tents. 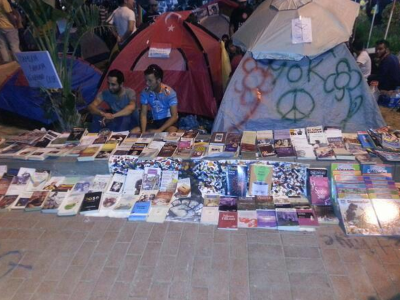 A library built by protesters in Antalya, Turkey. 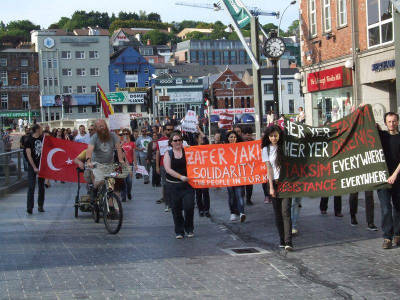 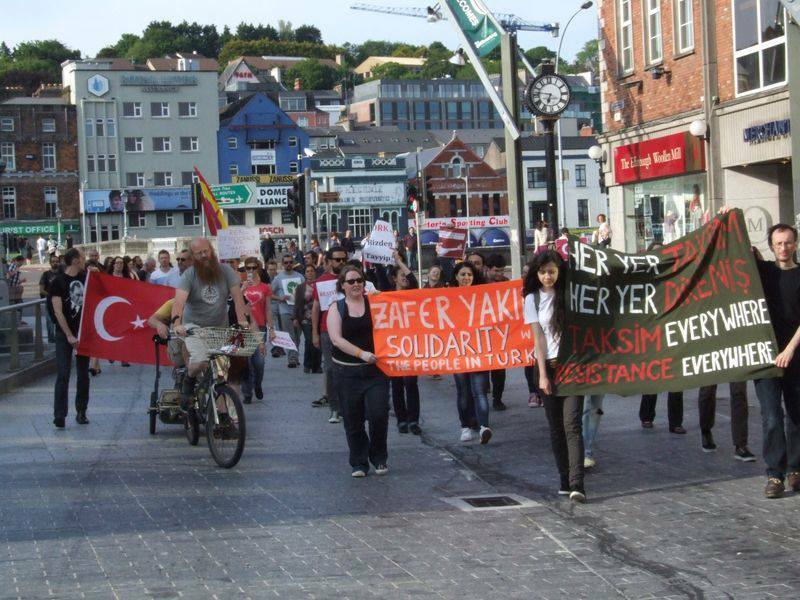 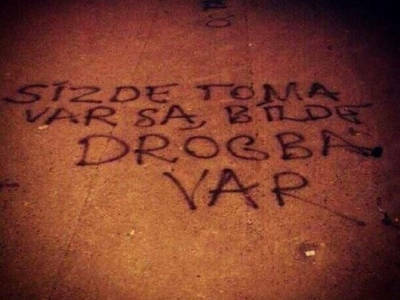 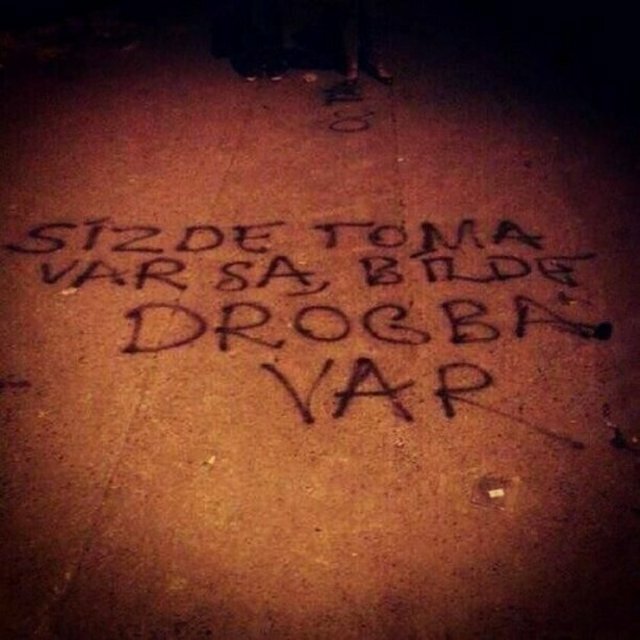 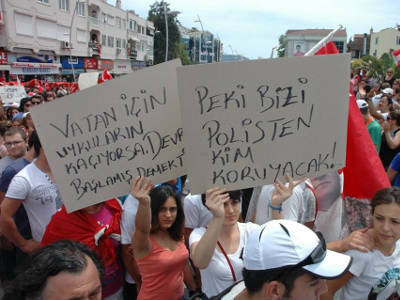 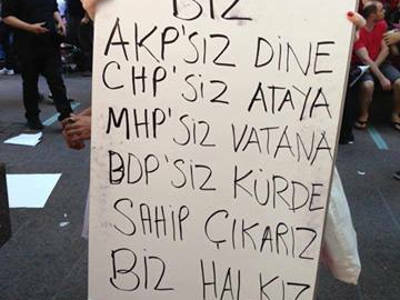 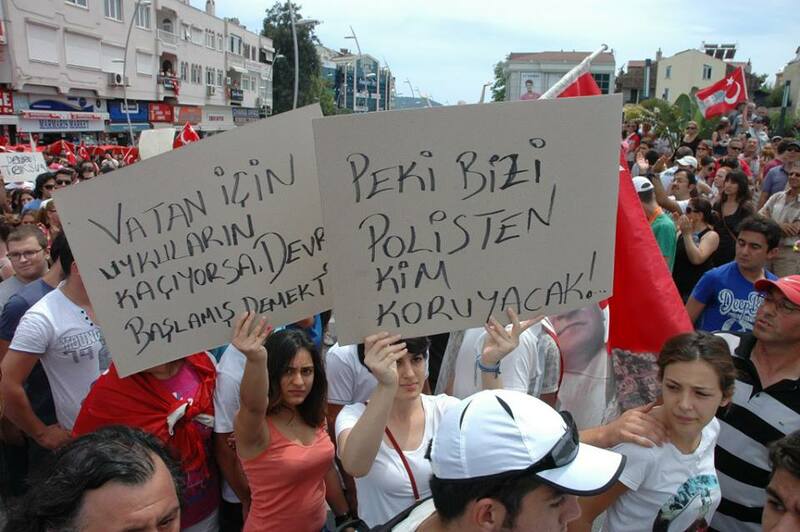 "Knock down AKP and build a shopping mall instead!" "So who will defend us against the police?" 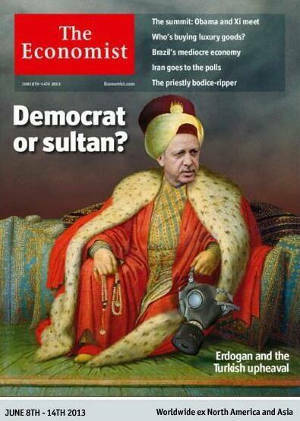 International release of the weekly magazine Economist.